There are certain things Paul Elliott, the owner of Keizer’s Uptown Music, can teach a new employee, like how to answer the phone and take good care of a customer. But, whenever he hires a new employee for the store at 3827 River Road N., Elliott is looking for the thing he can’t teach: a servant’s heart. “Having that servant’s heart will make them take the extra step – because they want to do it, not because we told them to,” said Elliott. The approach is working according to colleagues in the music retail industry. 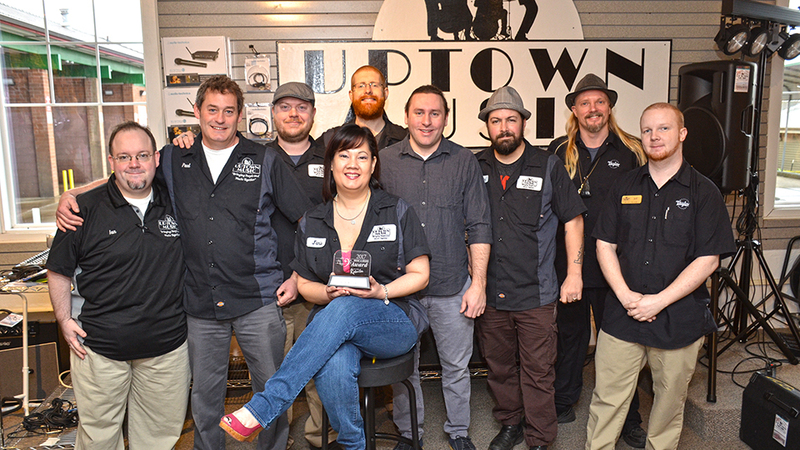 In January, the store was awarded the Music and Sound Retailer Award for best customer service for a single-store dealer. The store was selected out of thousands nationwide, Elliott said. “Sometimes customers call our vendors and manufacturers directly and those businesses ask who sold them the equipment, apparently we got a lot of good feedback and it was the manufacturers that nominated us,” Elliott said. Elliott wasn’t even aware the store was nominated until he got a call a few days before the National Association of Music Merchants conference in January. Representatives Sound and Music Retailer told him to stop by the organization’s table to pick up an award. With a big box retailer across town in Keizer Station and literally thousands of competitors online – all of which generally offer the same merchandise at comparable prices -– Elliott said top-notch customer service is the one thing the store can do to separate itself from the pack. Since most of the employees are also musicians, first-hand knowledge of the gear that makes them passionate about playing makes it easy to relate to customers’ needs and troubles when they occur. In addition to the store itself, Elliott is passionate about giving back to the community. Donations of refurbished guitars helped McNary High School and Judson Middle School launch guitar classes in recent years and he’s always on the lookout for ways to continue such efforts. He said the next phase of his ownership is to put more emphasis on what he calls Play it Forward. “Our goal is to simply never stop earning it,” he said of the customer service award.